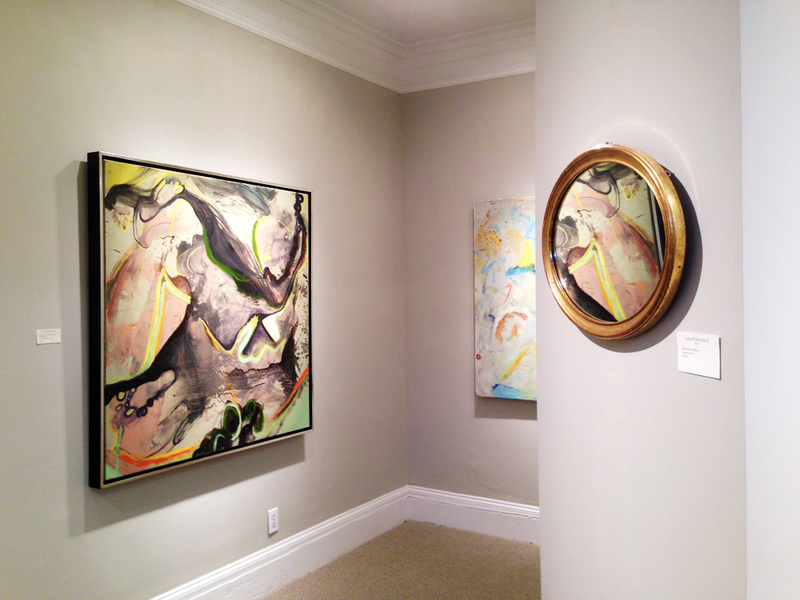 Haley and Steele Gallery is on the second floor on Newbury street, a cozy space with columns and mirrors visually breaking up and reflecting Hurwitz’s paintings. The paintings are large-scale , colorful, and joyfully abstract. But the true work of art here goes beyond the canvas. 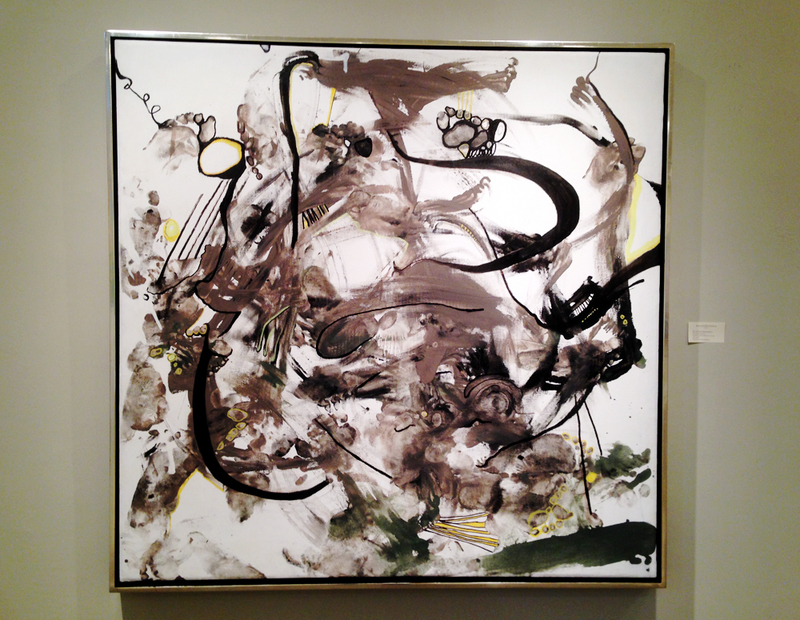 Hurwitz was inspired by the musical suite that titles his show, “Pictures at Exhibition,” composed by Modest Mussorgsky. Mussorgsky based the movements of the suite on drawings and paintings by Viktor Hartmann. Hurwitz decided to reverse this process – he played each movement of “Pictures at Exhibition” on the piano, while collaborator Imari Bratcher danced on a canvas, using his feet to apply paint while he moved his body in response to the music. After the performance, Hurwitz worked into each canvas further, using thin lines to emphasize certain gestures and organize the composition. Stills from video documentation of painting performances. The dancer’s energy is clearly visible in the gestural strokes of paint. The effect is sometimes calligraphic, smooth strokes written on a canvas. I love the playfulness of the toe prints highlighted by Hurwitz’s outlines. Other times the canvas becomes almost marbled in appearance, or the strokes seem speedy, almost rushed. Even thought the musical compositions aren’t audible, their character is clearly recorded. This is by no means to say that the paintings are merely direct translations of the music. The paintings are records of many things – the dance, Hurwitz’s painting, the music, the original now lost painting, all layered together in a way that creates an image that references rather than illustrates. Hurwitz’s method of creation places the paintings at the intersection of music, visual art, and history, asking the viewer to consider the nature of inspiration and the role it plays in artistic creation. Hurwitz questions the position of referent in relation to the final work – the source is quite separated from his response, but he uses visual and conceptual links to maintain the connection. Hurwitz’s show is many-layered; each element of the work refers to yet another part. The paintings succeed on both a visual and a conceptual level – they are intellectually exciting, but would still be visually engaging paintings even without knowledge of their larger context. See more of Dylan Hurwitz’ artwork Here. Learn more about Haley and Steele Gallery Here. Really interesting creation process and results.